The question is, can he get up from there? I did the maximum strength test last night which consists of "squatting" ever increasing weights until you fall over backwards. Its perfectly safe because the dumbbell is constrained to move in a vertical plane and there are safety stops so you don't get completely squashed. Diego measured the power I was able to generate with each successive weight increase using a small device which measures the velocity at which I could lift the bar. Just like a car has a different power response at different loads - typically a petrol engine has a "humped" power-torque curve with a maximum power at a sub-maximum torque (force) - it is interesting to know for what load (weight) we can generate the most power (force x velocity). I must have a diesel engine because I reached my maximum power just at the point where I reached my maximum force and literally could not lift the weight. Its quite a disconcerting sensation of impotence and bewilderment when you are literally unable to stand back up. 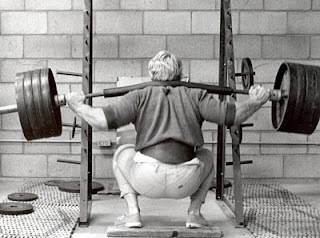 Once you get to these kind of weights, I think it becomes important to have a reasonably good squatting technique: if you let the weight fall too quickly it is impossible to overcome the momentum needed to change direction; if you go too slowly then you become tired. For some reason, my arms started to hurt much more than any other part of my body, presumably because I was straining against the bar, and today they are sore as hell - not sure how well I will swim today. My legs don't feel at all tired but then the dreaded DOMS (Delayed Onset of Muscle Soreness) as their name suggests, often set in after 48 hours. One of the interesting things that Jonathan has been experimenting with is the relationship between the velocity at which someone can squat and the weight. He has established a very convincing relationship between the two which means that you can estimate your maximum strength without having to lift maximal weights (which has its risks, of course, as well as being unpleasant). Unfortunately, the machine used for that test was at the menders so there was no option but to go until "failure". Now that I have the results of the test, I can follow Jonathan's weight program more correctly. When he sets me a weights session he specifies the number of sets, the exercises I should do, the number of repetitions in each set, the time I should take in lowering the weight in a controlled fashion, whether the lift should be explosive or not and, finally, at what percentage of my maximum strength (RM = Rendimiento Máximo) the lifts should be executed. Up until now, I have been setting the weight to be that which I can lift the number of times I have to lift it. Nevertheless, just as it is important to find that Maximum Effective Dose, it can be more effective to exercise sub-maximally. I find that for almost all the other exercises I do (lats, calves, quadriceps, isquiotibiales or hamstrings as they are more commonly known, glutes or bum) I need to use about half the weight I would squat in order to achieve the same intensity.